TICKETS AVAILABLE AT DOOR NIGHT OF EVENT! ONLY ONLINE PRESALE ARE CLOSED!! You Don't want to miss out on this incredible night!!! 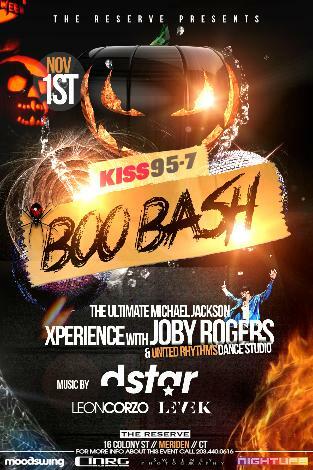 Join us for a sinister evening for Connecticut Biggest Halloween Event The Kiss 957 BOO BASH, taking place right in Central Connecticut at the Reserve in Meriden. Get ready for some spooktacular entertainment, as well as an eerie environment as we turn Connecticuts finest Reserve into a ghostly haunted scene!! Joby Rogers will be bringing the Ultimate Michael Jackson Xperience to Reserve alongside United Rhythms Dance Studio as they preform THRILLER to get the night started! Multiple performances to follow throughout the evening all leading to Moodswing's Very Own DJ DSTAR! Supporting music by Connecticut's own, Dj Leon Corzo aswell as NYC's Dj Levek..
Three levels of mystery patiently await you so please dress in your most extravagant costumes for great prizes and drink specials! !